May 9, 2014 –Victoria, British Columbia – iBoard Canada Manufacturing Inc. has welcomed His Worship Dean Fortin, Victoria City Mayor, to the company’s new headquarters. iBoard staff have demonstrated company’s latest LED-based interactive boards 9065 running the cutting-edge education software and offering a completely new educational experience. Mayor Fortin has tested the interactive board and commented that the operations were very straight forward and intuitive, as if using a tablet. iBoard management have shared with Mayor Fortin the company’s plans for further expansion in the Greater Victoria. Presently, iBoard’s interactive boards have been already installed in seven schools in the Greater Victoria and in a number of corporate offices and conference facilities. 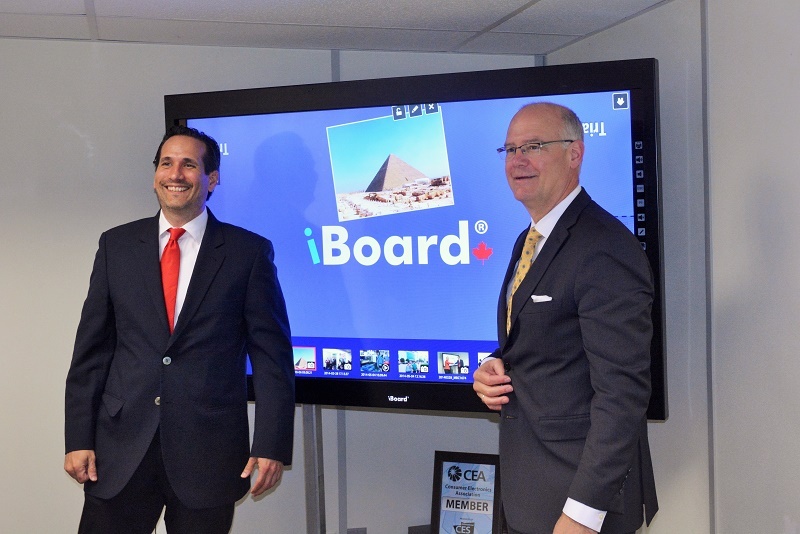 More than 10,000 iBoard solutions are already in operations globally and iBoard management have highlighted the increasing interest in company’s interactive boards in the Greater Victoria, and company’s plans to expand the presence in the region. “We are grateful for Mayor Fortin’s visit, for an opportunity to offer him a first-hand experience interacting with our products and for an insightful discussion of iBoard expansion plans in the Greater Victoria,” said Antonio Oquendo, Chair of iBoard Canada Manufacturing Inc.
For more information about iBoard Canada Manufacturing Inc. and its interactive solutions, please visit www.iBoard.ca.